Well it's the 200th week on the Less is More Challenge so the theme this time is CELEBRATIONS. I can't say I'm a regular by any means but I do try to enter as much as I can. There are always brilliant inspirational cards from the team and it's great fun to come up with simple but effective projects. This time I've gone for a party invite using the Firework and Celebrate Stamp sets from Oak House Studio. I stamped the Let's Celebrate first, masked it off and then went a bit wild with all the different fireworks, bursts and stars in a variety of colours!! I could have filled the page but remembered I had to leave some white space!! Hope you like and thanks for popping by. Thanks also to Chrissie and all her helpers over the last 200 weeks - great challenge and great inspiration!! 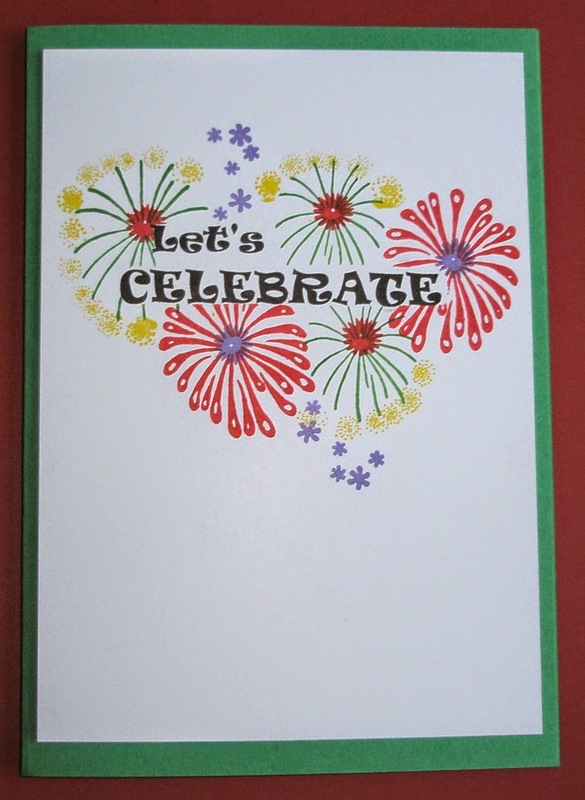 Lovely colourful fireworks Elaine, this is a super celebratory card! Loving those party fireworks Elaine and thanks for your kind words. Fabulous card, so colourful and happy. This is just super Elaine... great stamping...we love seeing your submissions. Thanks so much for your kind words and for joining in on our celebratory week! Lovely card, Elaine - colourful but still CAS!